I'm just wondering how those Orange amp owners who have a TH30, Dark Terror, or any other Orange with a shape control do get along with it. I've had my Dark Terror for over a year now and although I would not say the shape control is the easiest to use, I have to say that I get along with it quite well. between 2 and 2:30 o'clock. Was the shape control a deal breaker for you when you tried or bought an Orange amp with it as theonly e.q.? Or, did you find that you eventually embraced the simplicity of it? Last edited by adkguy07 on Tue Jan 01, 2019 5:52 am, edited 1 time in total. I think its neat, but not a big fan of it. I have zero problems getting exactly what I want out of it, but it is quite different and I can see why some folks need a more traditional EQ. Once you get a feel of it, you can do some rapid and radical EQ changes on the fly. I used to think it's great and useful feature, but after a year of having TH30 I changed my mind. It was OK for one setting (somewhere between 10:00 and 12:00), anything below of above was terrible sound. So, now I can say it is great if you are set and forget guy, but if you like to tweek then sooner or later you'll find it limiting. Now I'm happy with traditional EQ on my RV50. I have a Dark Terror and have found my sweet spot on it to be just between 1 & 2 o'clock (which, incidentally, is the same spot on my Micro Dark Terror). I do find it to be extremely sensitive and the very slight movement will alter your tone just that little bit more and that's what I feel is fundamentally the heart of frustrations other players may have with it. This knob essentially is the treble, middle, and bass all in one, its more likely you can alter a tone with the slightest change where as with the 3-band EQ the tone will not be altered as much when adjusting them independently. I hear ya! Glad someone else has discovered what is not so obvious to many. I also found that the shape control becomes more sensitive when I turn my amp volume up a touch more....including gain. From the get go, I delved into the myriad of gain tones from my own Dark Terror, but this past week I decided to trim the gain and try playing it clean.....as clean as I can get it. As a few reviewers have written, there is a definite clean side to this amp and I for one am glad the Ade didn't forget those of us who like playing clean on occasion. The sensitivity is part of what I like. I would be complaining if it wasn't sensitive. I haven't found going between say 10:00 and 11:00 is going to ruin my day, but there is a difference. I think I just really like the one knob simplicity. Where it didn’t work for me was I couldn’t dial out something I didn’t like. I could find a good sound no problem, but on my Rocker for instance I like everything maxed in the EQ, and dial out what I don’t want, usually treble or bass depending on the guitar. I don’t like scooped sounds, so theres really only one spot I liked the shape control set and that was all I had to work with. All passive eq’s sacrifice something when you adjust one thing, but the shape sacrifices more when adjusted. It’s a nice compact eq control though. Yeah, forgot to mention that a one knob solution to a 3-band EQ simplifies your spending endless time tweaking and not actually playing. 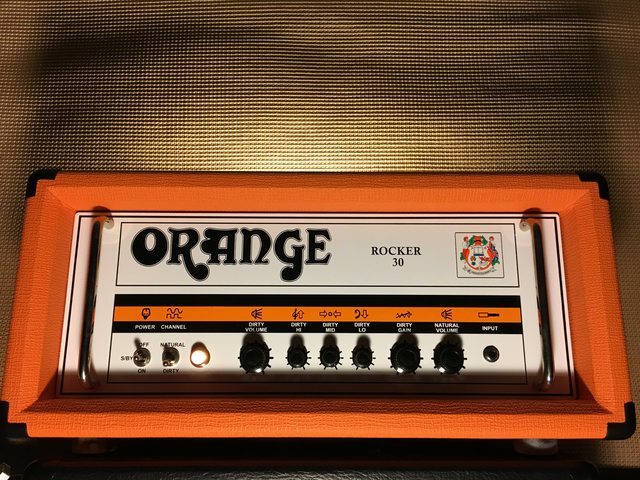 Orange has often made it their mission statement that on their amps, in keeping a true signal to ultimate tone would be better achieved with the least amount of interactions in between. The problem with your statement is that the shape control is a traditional three band eq configured into one knob, a dual gang pot for treble and bass. Fixed value resistor for mids instead of a pot. Same number of components interacting with the tone. Just less control. I think it’s a neat design, clever really, but not my favorite. I don’t spend a lot of time tweaking. Pretty much set and forget. I know one of my guitars likes some bass rolled off, but everything else left alone. I think we all kind of settle on one place that sounds good to us on any amp, but I use the whole left side of the shape control for different things, and I'm pretty sure I can approximate what you've described. It's not for everyone, though. A good old 3 knob eq is is a known entity, and just feels comfortable. My easy answer is if it works for you, then thats all that matters. If we all liked the Fender Bassman the way it was, thats all we’d ever have. Of course it all comes down to what type of pickups on the guitar as well as FX pedals or lack of them are all contributing factors that with the one knob tone/shape control you'll have to find the sweet spot where it all balances out but for you and your ears alone will you determine if it will work. it quicker with the shape control as opposed to a 3-knob e.q. section. I have a TH30 and for the most part appreciate the charm of the shape knob but the 3 band is where it’s at for me. The RV and AD eq is very tolerant to adjustments unlike say a Mesa so turning any knob too far doesn’t necessarily ruin the tone. I have found I like to dial in a lot of mids (usually dimed) and moderate highs (around 3 o clock) and then rolling out quite a bit of bass (somewhere between 9-11 o clock) which gives me a really nice punchy tone with a les Paul. That eq setting doesn’t really exist on the shape knob. In my world, the shape knob is not any faster to adjust than an orange 3 band and it is only more limiting. The TH30C is my grab and go jam amp, otherwise I would sell it.